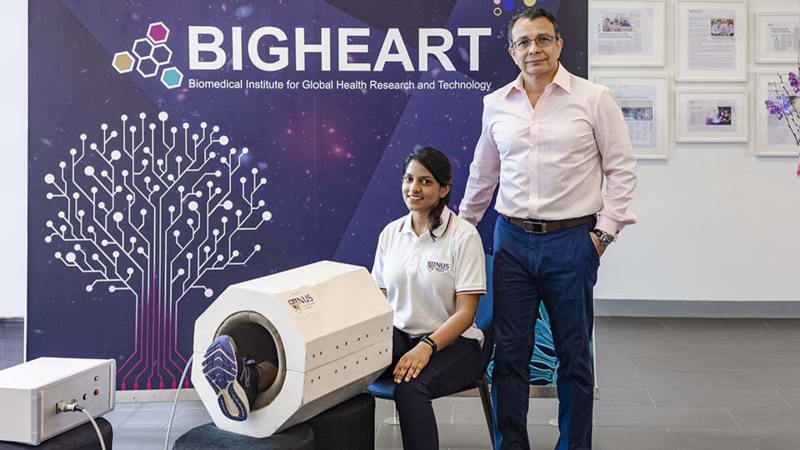 Assoc Prof Franco-Obregon explained that the device provides a uniform electromagnetic field to a muscle area at a magnitude and pulse duration that reproduces the same regenerative, energetic and metabolic responses as physical activity. The duration of use for the device has been optimised to provide the largest therapeutic effect in terms of muscle equality, function and metabolic stability. MRegen has shown promising results in two human trials conducted between 2015 and 2017. In the first trial, healthy individuals who received 10 minutes of magnetic stimulation in either their right or left leg once a week for five consecutive weeks showed an average of 30 to 40% improvement in muscle strength in both legs. The second trial targeted patients who had undergone anterior cruciate ligament knee surgery. 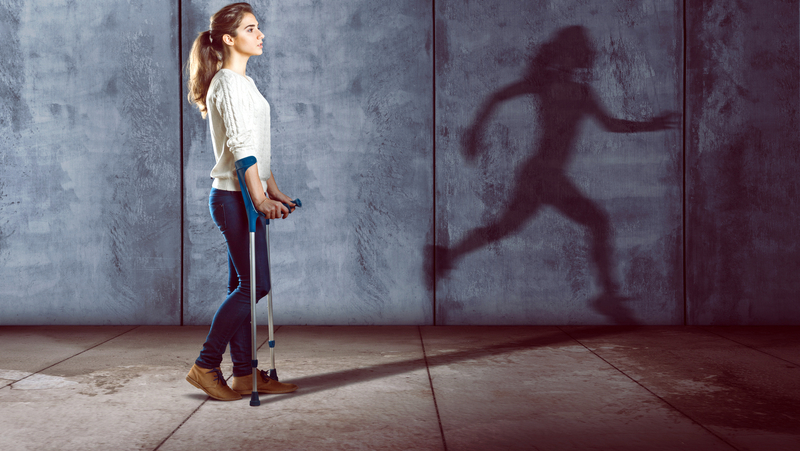 In this trial, patients who were treated with MRegen on top of normal rehabilitation therapy experienced a recovery in muscle size and strength in their operated leg four weeks earlier than those who had only received normal rehabilitation therapy. 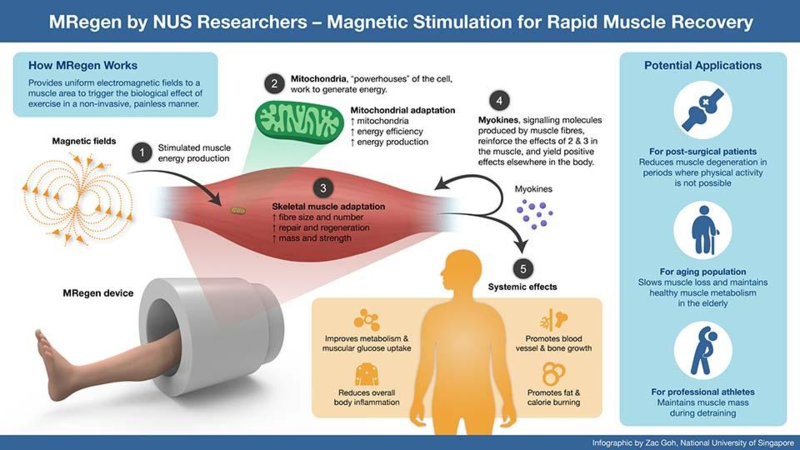 Moreover, Magnetic Resonance Imaging measurements showed that muscle metabolism, one of the strongest indicators of muscle health and regenerative capacity, improved by up to 50% in patients who had undergone MRegen’s magnetic field treatment. In both trials, field treatment in one leg also consistently appeared to have positively influenced the health of the other leg, demonstrating what is known as a contralateral effect. The technology holds great promise for slowing muscle loss and maintaining healthy muscle metabolism in the frail and elderly, professional athletes during detraining, as well as those with other health conditions such as obesity and diabetes. The researchers have filed a patent for the technology and plan to commercialise it through a spinoff QuantumTX. Assoc Prof Franco-Obregen emphasized that muscle makes up 40% of an average person’s body mass and plays a major role in regulating one’s body, health and longevity. If this is possible to harness the ability to regulate muscle development, this is also possible to gain greater control of the overall human health.